Louise it was so nice talking with you on the phone this evening Birdy is one handsome fella! After speaking with you & I have decided to stager three perches, 1 ft., 2ft. & 3 ft. and about a foot apart so that Birdy will be able to get a bit higher whne he's in the flight. I have also decided to attach wire ramps to a couple of the low, 2 ft. off the floor, nest boxes. This will make it easier for him to get in & out of one. Birdy will be a muscle bird in no time once he starts chasing the hens around the flight and I think he may just surprise you in his flying ability. I called and ordered the boxes that should arrive at Louise's home by the end of the week. ESL- Birdy's new living situation is idea with all the perches and wires. He looks very healthy. Chasing some hens should get him in better shape. Thanks Joe, for taking care of getting the boxes to Louise. Joe..........Thank you so very, very much for arranging to have the boxes sent to me. I will be watching and waiting for them. I have been truly blessed with all the concern, kindness and generosity extened by the membership here. This is truly the most wonderful forum I have ever been a part of. Thank you, John, Cynthia, Cindy, Charis and all the others who were instrumental in the setting up and establishing this site. It is truly amazing. What Robin is doing to customize Birdy's housing is amazing. Birdy will be soooooooo happy. I can't wait to see him with the other pigeons and chasing Pinky and the hens around. It has been heartbreaking watching him on the back patio in his cage, while he watched his mate and the other backyard birds, knowing that he could not rejoin him. This is going to be the rebirth of Birdy...........finally he will have a sense of some freedom and be reconnected with other pigeons........I cry just thinking about how happy he will be. Again..........Thanks to all here that is making this micacle possible.........there are not enough words to express my appreciation. Very moving thread and another amazing story. I gave Birdy a bath today. I told him he had to preen up the feathers to get himself looking good for all the ladies at his new home. He is such a sweetheart, very easy to handle for an adult feral. I can't wait to see him romping around with pigeons again. He has been so lonely. What a miracle this has been for both me and Birdy. You must be torn between happy and sad at seeing Birdy go, you obviously love him so much. It must make it easier to know you will always be able to hear how he's going on and enjoy the fact he's completely safe from now on. Yes Janet it will be bitter-sweet, but the best possible solution for Birdy. He was an adult, with a mate and a flock when he was injured. It has been heartbreaking watching him longing to be with his mate and the other birds from behind the barrier of the cage door. I so much wanted him to fly again so he could rejoin them. I feel totally confident that he will have a wonderful life with Robin and her birds and I know she will keep me updated and provide me with pictures in the future. Again, this is a miracle for both me and Birdy. I've just heard from Louise that shipping Bird to Robin will cost $32.35. If you can help with a small donation, please let me know through private message or post here. I'm so sorry you've had so much sadness and problems in your life recently! And having to part with your birds must have added to that! I remember way back the incredible effort you made to stop your local ferals from being lured onto the street and run over. You deserve a whole lot better from life, and I hope and pray that your health and your situation improve. In the midst of all this, it's a blessing to know that Birdy and the youngsters will be safe and loved, and that you will be able to have news of their progress. 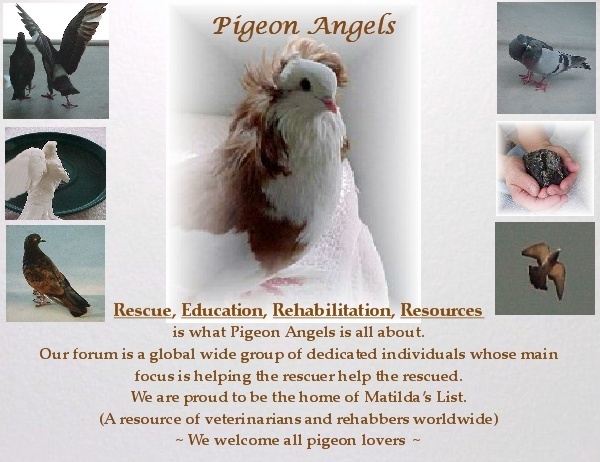 And you're right: this site is Heaven for pigeon lovers! Teresa.............These birds are all from that same feral flock. They are no longer in the street. It took some time, but I have them all trained to feed in my backyard. Approximately 100 of them. I haven't had a bird run over in the street in months........Thank God. However, I have encountered new problems with the neighbors. A guy with the BB Gun.....the one who got Birdy. And my neighbor directly behind me that has thousands of the the spikes up on his roof. I believe that is how my little bird with the eye injury got hurt. Most of the birds have learned to stay away from the spikes, but this little one was only about a month old........just learing to fly, and must have flown head first right into them. I do my best to protect them and care for them, but until we can change the minds of all the people that hate them, these birds are always in jeopardy. I totally agree with you. There's a lamentable lack of respect for life, and when pest control companies start spreading their malicious lies, every bully thinks it's not only his right but his duty to harm them. As in Portugal, I believe that in most US states it is illegal to fire a gun in a residential area, so it's well worth asking what your local laws are. God bless you for your efforts on behalf of pigeons! Count me in. I'll text you Charis. I just wanted to let everyone know that I have coordinated everything with Robin (egypswiftlady) to have Birdy shipped to her this coming Monday. I am preparing Birdy's shipping box by putting a cut to measurement piece of carpet padding in the bottom of the box, and then having a really thick towell on top of it. I want Birdy to have plenty of cushioning for his trip. I will also be placing a cucumber cut in half in the box with him should he require any moisture. The box will be marked with magic marker will all contact info as well as on the shipping label. I have checked the weather forecast for his destination and they are forecasting clear, sunny skies with the temperatures between 45/50 degrees through the middle of the week. I will be delivering Birdy to the main post office here in Vegas at 2:00PM on Monday. His flight is schedueled for 4:00PM. They have told me he should be delivered to his destination by 3:00PM on Tuesday. I have spoken to Robin and she said she has had birds delivered to her before, and her post office calls her immediately when the birds arrive. So all conditions seem right, but I am still so nervous..........I will have no peace of mind until I know Birdy is safe and in Robin's arms. I will update again, when Birdy is on his way. Thank you again to everyone who helped make this miracle possible. I believe you can track birdy's progress through the USPS website. You just need a tracking number off the shipping box. I have received many birds via USPS from New York and Florida without a hike. The folks at my post office are the best. That's why I give them a See's candy box each year. I'm so pleased everything is moving along so well. You deserve some relief from all the pressures you have been under. Just be careful there is nothing he can get a nail caught on, or any threads that can get wrapped around a toe. Even a little fraying on a towel can unravel. I learned that the hard way. I hope Birdy has a safe and fast trip. Jen..........You are so right. Thank you for bringing that to my attention. I will find a nice soft and warm piece of fleece to put in the box instead. BIRDY IS ON HIS WAY TO ROBIN!!!! I just returned home from bringing Birdy to the main post office. He is now on his way to his new forever home and mommy Robin. I was so sad to put him in the box, he was scared, but soon settled down and seemed comfortable. I made it nice and soft for him in the box. I will greatly miss him, but I know this the best for Birdy. He has been so lonely. I can't wait to see him back with other pigeons enjoying himself. The Post Office has reassured me again that he will be delivered to Robin by 3:00PM tomorrow. Again, sincere thanks to all who made donations and made this happy ending possible. Thanks for the update Louise. Be rest assured, you are not traveling alone.